Congratulations, you made it through the week! As a reward, you get two summer days in Vancouver. Do you have plans already? Here are some ideas on how to spend the upcoming days. I will start off the weekend like real Canadians: with country music and line dancing. It is Cowgirl Friday in the Yale Saloon tonight. So ladies, until 11pm you do not have to pay any entrance fee! The line dancing lesson starts at 8pm. And don’t worry – everybody can join the fun, no matter if you’ve already done it before or not. A real cowboy shows the choreography and you can just copy his steps. Yes, a cowboy! So, guys, you are also more than welcome to join the lesson. It’s a lot of fun and definitely a must-do when in Canada! On Saturday, the INTERNeX crew is going to explore White Rock. This cozy town is located about an hour away in the south of Vancouver. We got plenty of time to take pictures in front of the actual white rock and discover the pier. 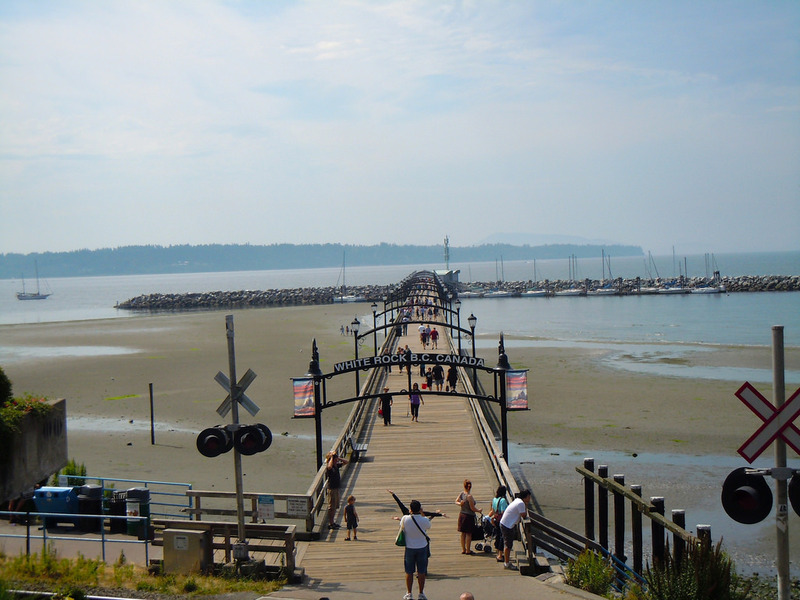 White Rock is also a great place to walk along the promenade and to enjoy the sun at the beach. Meet us at 11am in front of the Vancouver City Centre Station, if you want to join this relaxed day. Have you ever seen a sports match in Vancouver? Saturday is your chance to watch the game of the Vancouver Whitecaps FC vs. New York Red Bulls. Kick-off is at 4pm at the BC Place, the big stadium that you have probably already seen in downtown. There are still tickets available, check it out here. The ambiance in the stadium is different than in a European one, so buy your ticket and discover the Canadian way. Pretty cool Saturday afternoon for all football fans guaranteed! Sundays are for relaxing! However, the weather is too good to stay in bed all day. So, grab a blanket and go to the VanDusen Botanical Garden. Together with you friends, you can enjoy a chamber concert in this beautiful setting. The ‘Social Sunday’ takes place from 4-6pm. You only have to pay the regular admission fee of $11.25 to visit the garden and enjoy the live music. Cocktails, snacks, music and sun – sounds like a perfect Sunday to me! Whatever you are up to, enjoy your weekend! I hope to spend my last Saturday in Canada with many of you in White Rock.